· The manufacturer of the attached camera. See Camera Controls for a full description. Common camera controls are described first followed by descriptions of manufacturer specific camera controls. · The controls are grouped logically and each group can be expanded/closed as required. Each group has its own heading colour which helps you quickly identify the correct group when looking for a particular control. · The control groups can be grabbed with a mouse and the order re-arranged to suit user preferences. To reset the order to default, use Options > Reset Control Order from the main menu. · The title bar of the panel can be used to drag the panel out of the main SharpCap form, for example to place it on a second monitor. · The pin icon can be used to Auto Hide the Camera Control Panel, leaving it docked at the side. · A new value can be typed in for many controls. Any camera controls showing a numeric value (gain, exposure, brightness and many others) can be changed by typing a new value into the display box and pressing <Enter> or <Tab>. If a value typed in is out of range, the value will be ignored. If you are running out of space on your screen, you can make the SharpCap control panel auto-hide itself by clicking on the pin icon to the left of its title. Once you have clicked the pin, the control panel will hide itself when you move your mouse away from it and reappear when you move the mouse back. Click the pin again to go back to the default behaviour. You can also drag the control panel to the left hand side of the SharpCap window or detach it from the window completely. Capture Profiles allow you to save all the settings for a camera once you have adjusted them to your satisfaction. You can save multiple profiles and give them useful names (Moon, Jupiter, Saturn, etc). SharpCap automatically adds the camera name to the name you enter for each profile - after all, you may well need different settings for the same target depending on which camera you are using. You'll find capture profiles at the top of the control panel. To create your first profile, get the camera settings adjusted as you want them and then click the 'New...' button. You can also set a profile as default. Each camera can have its own default profile. The default profile is loaded automatically when the camera is started. This is a great way to set a default exposure, gain, resolution etc. each time you open a particular camera. When you select a camera in SharpCap (or SharpCap automatically selects a camera when it is started), SharpCap starts grabbing and displaying frames from that camera straight away. Don't worry - SharpCap isn't saving these frames, just showing them on the screen. SharpCap will only save images after you've used the 'Start Capture' or 'Snapshot' buttons. You might think of the automatic preview as being a bit like looking through the viewfinder of a camera. If you are using an ASCOM focuser from withing SharpCap and you use one of the focus aids that displays a graph (FWHM or Contrast detection), SharpCap will display a trace of the focuser position overlaid on the focus score graph. This can be very helpful as you can see which position on the focuser gave the best focus score. Remember that most focusers have some degree of mechanical backlash, so always aim to approach the target score from the same direction. If you want to enable the alignment feature in Live Stacking, you need to make sure that SharpCap can detect at least 3 stars on each frame. SharpCap looks at the shapes of triangles it can create from the stars it finds to work out how to align each frame onto the stack. To adjust the star detection parameters, go to the 'Alignment' tab in the Live Stacking window. You can make SharpCap highlight the stars it is using (yellow box) and other stars it has found (red box). SharpCap polar alignment works by plate solving two fields of stars near the celestial pole and comparing the point that they rotate around with the position of the pole. SharpCap will then guide you through making the Alt/Az adjustments needed to correct any alignment error. Select 'Polar Align' from the Tools menu and follow the instructions. You will need a field of view of bewteen 0.5 and 2.5 degrees (a guide camera in a 200mm finder-guider works well) and a camera with square pixels (the aspect ratio of the image on screen must not be distorted). Just tick the 'Save Individual Frames' checkbox. Each frame that is added to the stack will be saved as a PNG file (for 8 bit frames) or a FITS file (16 bit frames). Frames that are not added to the stack due to filtering, frame rate or alignment issues will not be saved. Enable any focus score method and then select the 'Graph' tab (shown to the right of the main history chart). This shows how the focus score changes with different focuser positions. Green upward pointing triangles show points where the focuser was last moved in the +ve direction, red downward pointing triangles show points where it was last moved in the -ve direction. Older points are shown with paler colours. To get best focus, move the focuser through a range of values in one direction to find the best score achievable and the position for it, then go back to that point making sure you arrive moving in the same direction to avoid backlash problems. As well as collapsing any control groups that you don't often use, you can also change the order of the control groups by dragging them into a new order using the drag grip (three horizontal bars) to the right of the group title. Use 'Capture Dark...' from the Capture menu to start capturing a dark frame. You can choose the number of source frames to average and SharpCap will do all the work for you. SharpCap will also file the newly created dark frame in a folder structure split up according to camera, resolution, exposure, gain and temperature, to help you find the correct dark frame later on. You can apply a dark frame by selecting it using the 'Browse' button on the 'Subtract Dark' control in the preprocessing group. When you browse for a dark, SharpCap will automatically start you in the most appropriate folder in your SharpCap dark library. Using dark frame subtraction will apply not only to the frames as displayed on screen but also to the captured frames saved to file. Note that for webcams and frame grabber devices you can apply a dark frame in the Live Stacking options only (not in the main camera controls). A DirectShow exposure value is a whole number. Zero indicates a 1 second exposure, negative values (most common) are exposures of less than one second, positive values (rare) are more than one second. Every change of the value by 1 is a doublying or halving of the exposure. That means that -4 is 1/16s and +4 is 16s; -6 is 1/64s and -8 is 1/256s. Unfortunately, some webcam driver writers got this wrong (Logitech even got it the wrong way round in their drivers for several years), so some cameras don't actually obey these rules. SharpCap can add a timestamp showing the date and time to captured frames from many cameras. Supported cameras include ZWO, QHY, Altair and iNova cameras, and DirectShow cameras when capturing in MONO8 or RGB24 format. DirectShow cameras capturing in compressed formats (I420, MJPG, YUY2, etc) are not supported as SharpCap would need to decompress, alter and then recompress each frame. A Capture Profile is a collection of camera settings stored in a text file. Various profiles can be loaded to have instant access to known collections of settings for different targets and cameras. · Load – loads the values from the capture profile currently selected in the drop down and applies them to the camera controls. · Save – takes the current values of the camera controls and writes them to the profile currently selected in the dropdown (overwrites the profile). · Save As – creates a new profile from the current camera control values. · Manage – shows the Capture Profile management screen, which allows you to rename, delete and set capture profiles as default. 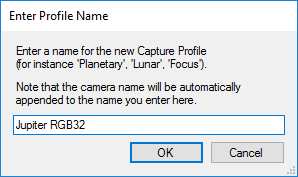 A new Capture Profile can be created by clicking Save As, entering a meaningful profile name, followed by OK. Note, changing the selected item in the drop down of profile names doesn't do anything by itself, it just changes the profile used if Save or Load is pressed. 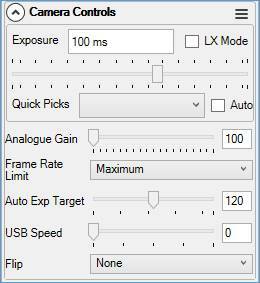 If a default profile is set for a camera then that profile is automatically loaded each time the camera is opened. The controls in this section allow management of the resolution, bit depth, colour space and binning of the camera as well as the save format for any captured images. An alternate Colour Space can be chosen if required. When using the FWHM or Contrast Detection focus score tools, be sure to set the right black level, as this will ensure that you get accurate readings. You should set the black level so that all of the sky background around stars or planets is excluded from the calculation. The areas being excluded are highlighted with stripes in preview. If you have set the black level correctly then the FWHM will not change much if you change the size of the ROI selection box and the contrast detection score will not be including noise in the background. When the reticule is displayed you can move its center point by clicking anywhere on the preview display. Clicking with the right mouse button instead will adjust the orientation or size of the reticule. For some cameras, 'Auto' output format selection will be chosen by default. You can turn off auto selection and select an output format manually or disable 'Auto' being the default in the settings. 'Auto' output format will typically pick the best output format for the exposure and colour space selected. For short exposures (<5s) a video format will be chosen, for longer exposures a still format will be chosen. 'Auto' will select basic output formats (avi, png) where they support the colour space being used, otherwise it will pick advanced output formats (ser, fits) - for raw capture or 16 bits per pixel. For most cameras except Webcams and Basler Cameras, SharpCap now supports a live stacking mode where many short frames can be added together and faint images will appear in real time. When you select Live Stacking from the toolbar you will be able to see details of your stack so far (number of frames, total exposure, histogram) and you have the ability to clear and save the stack. You can also adjust the white and black levels used when generating the display image from the stack (these adjustments will not affect the saved files). Saved stacks are always saved in .fits format and will be named using the same rules as any other captured image. SharpCap will warn you if the frame rate is too fast for the live stacking code to keep up. 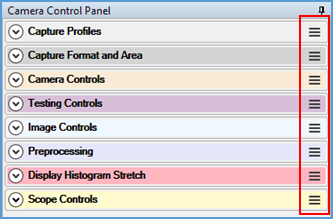 For all supported cameras (except DirectShow cameras), SharpCap includes a 'Display Controls' group in the control panel. These controls allow you to adjust the brightness, contrast and gamma used to display images, allowing you to bring out faint detail easily. 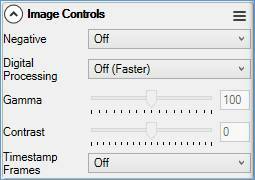 They provide similar effect to the 'Image Boost' options in the FX dropdown but with finer control. Making adjustments to the controls in the Display Controls section only affects how the images are displayed on screen - it will not make any changes to the images saved to any capture files. Any camera controls that show a numeric value (gain, exposure, brightness and many others) can be changed by typing a new value into the display box and pressing <Enter> or <Tab>. If you type a value that is out of range, the value will be ignored. For the exposure control, you can type a new exposure value with appropriate units, i.e. 15ms or 10s (Sadly last bit this doesn't work for most DirectShow cameras, which only accept exposures as numbers like -3 or -5). When the output format is set to Auto, SharpCap will chose the most appropriate save format for capture files depending on the colour mode chosen and the exposure length. Exposures of less than 5s will be saved into a video format. Exposures of 5s or more will be saved as individual frames. RGB and Mono at 8 bits per pixel will be saved to AVI or PNG. 16 bit per pixel or RAW modes will be saved to SER or FITS. The controls in this section allow management of the exposure, gain and other mostly hardware related features of the camera. The controls in this section allow application of basic image processing such as brightness, gamma and contrast to the images being captured by the camera. The range of controls available is determined by the camera manufacturer/camera driver author. ·If you are running out of space on your screen, you can make the SharpCap control panel auto-hide itself by clicking on the pin icon to the left of its title. Once you have clicked the pin, the control panel will hide itself when you move your mouse away from it and reappear when you move the mouse back. Click the pin again to go back to the default behaviour. ·You can also drag the control panel to the left hand side of the SharpCap window or detach it from the window completely. ·Capture Profiles allow you to save all the settings for a camera once you have adjusted them to your satisfaction. You can save multiple profiles and give them useful names (Moon, Jupiter, Saturn, etc). SharpCap automatically adds the camera name to the name you enter for each profile - after all, you may well need different settings for the same target depending on which camera you are using. ·You'll find capture profiles at the top of the control panel. To create your first profile, get the camera settings adjusted as you want them and then click the 'New...' button. ·You can also set a profile as default. Each camera can have its own default profile. The default profile is loaded automatically when the camera is started. This is a great way to set a default exposure, gain, resolution etc. each time you open a particular camera. ·When you select a camera in SharpCap (or SharpCap automatically selects a camera when it is started), SharpCap starts grabbing and displaying frames from that camera straight away. Don't worry - SharpCap isn't saving these frames, just showing them on the screen. SharpCap will only save images after you've used the 'Start Capture' or 'Snapshot' buttons. ·You might think of the automatic preview as being a bit like looking through the viewfinder of a camera. ·If you are using an ASCOM focuser from withing SharpCap and you use one of the focus aids that displays a graph (FWHM or Contrast detection), SharpCap will display a trace of the focuser position overlaid on the focus score graph. ·This can be very helpful as you can see which position on the focuser gave the best focus score. Remember that most focusers have some degree of mechanical backlash, so always aim to approach the target score from the same direction. ·If you want to enable the alignment feature in Live Stacking, you need to make sure that SharpCap can detect at least 3 stars on each frame. SharpCap looks at the shapes of triangles it can create from the stars it finds to work out how to align each frame onto the stack. ·To adjust the star detection parameters, go to the 'Alignment' tab in the Live Stacking window. You can make SharpCap highlight the stars it is using (yellow box) and other stars it has found (red box). ·SharpCap polar alignment works by plate solving two fields of stars near the celestial pole and comparing the point that they rotate around with the position of the pole. SharpCap will then guide you through making the Alt/Az adjustments needed to correct any alignment error. ·Select 'Polar Align' from the Tools menu and follow the instructions. You will need a field of view of bewteen 0.5 and 2.5 degrees (a guide camera in a 200mm finder-guider works well) and a camera with square pixels (the aspect ratio of the image on screen must not be distorted). ·Just tick the 'Save Individual Frames' checkbox. Each frame that is added to the stack will be saved as a PNG file (for 8 bit frames) or a FITS file (16 bit frames). Frames that are not added to the stack due to filtering, frame rate or alignment issues will not be saved. ·Enable any focus score method and then select the 'Graph' tab (shown to the right of the main history chart). This shows how the focus score changes with different focuser positions. ·Green upward pointing triangles show points where the focuser was last moved in the +ve direction, red downward pointing triangles show points where it was last moved in the -ve direction. Older points are shown with paler colours. To get best focus, move the focuser through a range of values in one direction to find the best score achievable and the position for it, then go back to that point making sure you arrive moving in the same direction to avoid backlash problems. ·As well as collapsing any control groups that you don't often use, you can also change the order of the control groups by dragging them into a new order using the drag grip (three horizontal bars) to the right of the group title. ·Use 'Capture Dark...' from the Capture menu to start capturing a dark frame. You can choose the number of source frames to average and SharpCap will do all the work for you. 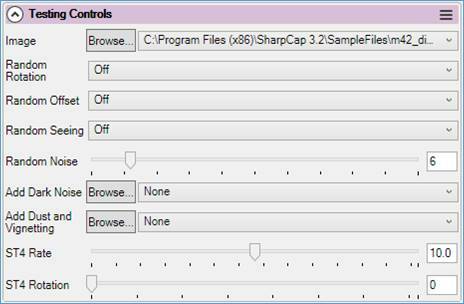 SharpCap will also file the newly created dark frame in a folder structure split up according to camera, resolution, exposure, gain and temperature, to help you find the correct dark frame later on. ·You can apply a dark frame by selecting it using the 'Browse' button on the 'Subtract Dark' control in the preprocessing group. When you browse for a dark, SharpCap will automatically start you in the most appropriate folder in your SharpCap dark library. ·Using dark frame subtraction will apply not only to the frames as displayed on screen but also to the captured frames saved to file. Note that for webcams and frame grabber devices you can apply a dark frame in the Live Stacking options only (not in the main camera controls). You can configure dark subtraction and flat frame correction here. SharpCap’s flat frame correction code has been designed to allow it to process images at high speed from USB3 cameras, allowing the live removal of artifacts such as dust shadows will capturing lunar/solar/planetary imaging videos. See Capturing and Using Dark Frames and Capturing and Using Flat Frames for more details. This control shows an always-on mini histogram of the current image and allows the image displayed on screen to be ‘stretched’ without affecting the data saved to file when capturing. Stretching the displayed image means that the brightness and/or contrast can be enhanced, or faint detail can be brightened easily. The stretch function provides similar effects to the Image Boost options in the FX dropdown but with finer control. 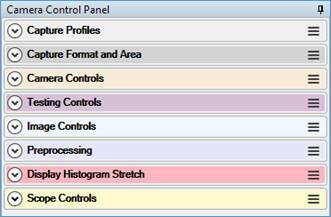 See Mini Histogram and Display Stretch for more details. The testing Controls group is specific to the two test cameras included with SharpCap. The controls allow for the simulation of atmospheric conditions, addition of simulated dark noise or dust specks and a simulated ST4 guiding port. · Thermal controls such as fan on/off.